"Good for when friends drop by during the holidays. Quick and tasty. Add rum for a bit of a kick." 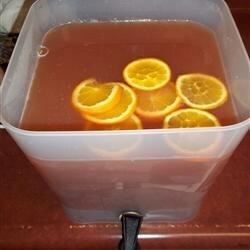 In a large punch bowl, combine cranberry juice cocktail, lemonade, and orange juice. Stir in the maraschino cherries. Refrigerate for 2 hours or more. When ready to serve, pour in the ginger ale. Garnish each glass with an orange slice. Every easy and my guest seemed to enjoy. I made Ice ring with 1 c of cran, 2 cups of lemonade,1 cup of orange juice added orange slices and cherries, then froze and put in punch to keep it cold. I didn't like how tart the cranberry juice made it, so I added extra lemonade and orange juice and gingerale. It was pretty good, but I've made better. I could not make this punch fast enough for my holiday guests! I added Meyers Dark Rum and it was just the right touch. Thank you for a wonderful beverage. I served this punch at a Christmas party, and everyone loved it! A few people even asked me for the recipe. I made an ice ring with pinapple/cranberry juice and orange slices to keep it cold.